Elements of Jesus' teaching he returned to again and again. Jesus' mission in his own words. Jesus claimed a number of remarkable things about himself. 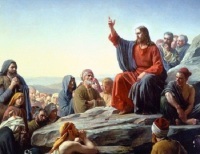 Jesus answers a question about commands, and provides a new one. The Golden Rule. You've heard of it. This is where it comes from. Jesus' warnings are always relevant.